Sweden's Timmy Hansen is the first ever driver to set a quickest FIA World Rallycross Championship qualifying time on the African continent by winning Q1 in Cape Town, South Africa. Hansen won Q1 race three in front of Norway's Petter Solberg, who ended up third, behind World RX Champion Johan Kristoffersson. Sweden's Kristoffersson didn't make the perfect start in race five but jumped Norway's Andreas Bakkerud by taking his joker on lap three. Bakkerud led from the start and took his joker on lap four. He returned to the main circuit behind the PSRX Volkswagen Sweden driver and then spun through the final chicane, but still managed fourth quickest time. 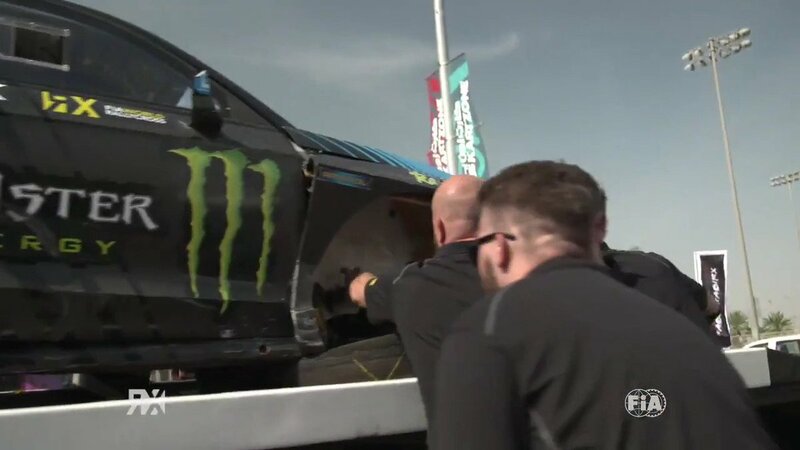 America's Ken Block made the best start in Q1 race two to win the race and was fifth quickest behind Hoonigan Racing Division team mate Bakkerud. Sixth quickest was MJP Racing Team Austria's Timo Scheider, the German driver leading France's Sebastien Loeb and team mate Kevin Eriksson through the four lap race. Loeb was seventh quickest, Sweden's Mattias Ekstrom was eighth, Russia's Timerzyanov ninth and Eriksson tenth. Home heroes Ashley Haigh-Smith and Mark Cronje took part in their first ever World RX races on Saturday afternoon at the Killarney International Circuit in Q1. Haigh-Smith joined Olsbergs MSE team mate Oliver Eriksson in race four but made a slow start. Cronje started from pole position in the final race of the session and was third on lap one. He finished the race fourth behind Kristoffersson, Bakkerud and Finland's Niclas Gronholm. Belgium's Guillaume De Ridder was quickest in Q1 of the RX2 International Series ahead of Britain's Dan Rooke and Sweden's Andreas Backman. Find full Cape Town RX Q1 results here.